Bangalore: For the past 12 years, Akshaya Patra Foundation has served cooked food to nearly 14 lakh children in government schools across the country. And now, it has reached an important milestone. The foundation just served its billionth meal in August. From a very modest beginning, the foundation now covers most government schools in nine states across the country. Now, even as students increase and volumes expand, Akshaya Patra Foundation has not lost sight of its core principle – serving tasty and nutritious food to children. To celebrate the grand milestone of its billionth meal, the Foundation got music director Shankar Mahadevan and lyricist Javed Akthar to compose a theme track for them. Akshaya Patra now hopes that in some years, the country will have food security and people won’t need the support of such foundations. But till then, they will continue providing healthy food to many more under-privileged children across the country. How are you? I am fine, thank you. My name is Rani. I am studying in the 10th standard. We do not know each other, but I thank you from the bottom of my heart for changing my life forever. I come from a small village outside Bangalore. My parents moved to the city to find work, leaving behind their farms. It was not easy at all. My father found work on a construction site and my mother works in other people’s houses. Even I had to do small-small jobs to earn money. There was no other way. How would we eat otherwise? I thought moving to a big city meant that I could go to school. But it looked like an impossible dream. Then one day, we heard about this school that feeds children. I begged my parents to consider sending me to school now. After all, their burden would be reduced, right? After much pleading, they finally agreed. And I started going to school. My first day at school was the happiest day of my life. I’ve never missed a single day of school since then. At school, I asked my teacher, “Who is sending us this food?” The teacher told me that it was you, and many more people like you. She told me that you made a special contribution to help Akshaya Patra make this meal for me. I can’t tell you how grateful I am to you, and to Akshaya Patra. That is why I am writing you this letter today, to thank you. I cannot imagine my life without this meal and without this school. Please keep up the good work. I will also send you letters from time to time, telling you about what is happening in my life. A balanced diet is one which contains a proper concentration of essential nutrients like proteins, vitamins, minerals, and carbohydrates that help the body function well and maintain good health. This is a necessity in every individual. However, a balanced diet in children is an absolute necessity. At The Akshaya Patra Foundation, they don’t just prepare meals for children; they make sure that every meal that reaches our beneficiaries is enriched with the required components for their physical, cognitive and mental development. Vitamins and Minerals: Beetroot, cabbage, cauliflower and carrots are the most common ingredients found in the mid-day meal on any given day. These are rich in vitamins and minerals that are highly responsible for the mental growth and cognitive development in children. Carbohydrates: The Akshaya Patra kitchens situated in the Southern region of India prepare rice to suit the local palate, whereas in the North, they provide Rotis to the children. Both the varieties contain sufficient amount of carbohydrates that help store energy in the body. This helps children stay active all through the day. Proteins: Spinach, potatoes and pulses like lentils and beans are regularly used in the school meals. A major advantage of these vegetables is that they are low in saturated fat and high in fiber which helps keep the body fit and active while also regulating the body’s metabolism. What’s more, even the ingredients used in garnishing all the vegetable dishes like curry leaves, cardamom, coriander, cumin seeds, and cloves, also have a nutritional concentration in them. At every Akshaya Patra kitchen across 10 states and 22 locations in India, there is no compromise when it comes to including nutritional ingredients in the meal that a child is about to consume. At our kitchens, they strongly believe that childhood is a sensitive period of development when growth occurs and they want to provide our children with all the nutrients they need to succeed in life. 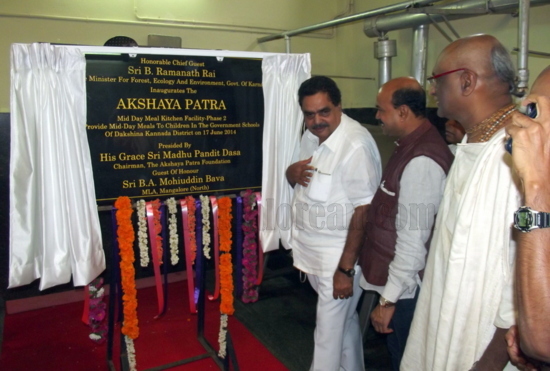 ; The Akshaya Patra Foundation has reached another milestone with the inauguration of the phase-2 of the Mangalore kitchen by B.Ramanath Rai, Honourable Minister for Forest, Ecology & Environment, Govt. of Karnataka. B.A. 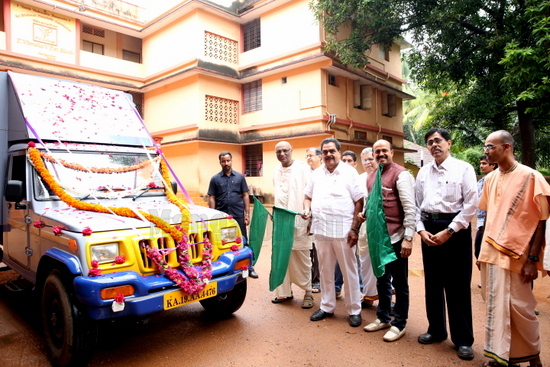 Mohiuddin Bava, MLA, Mangalore (North) and Madhu Pandit Dasa, Chairman, The Akshaya Patra Foundation and Karunya Sagar Dasa, President, The Akshaya Patra Foundation, Mangalore were also present on this occasion. The event was planned in a three phased manner. Speaking during the occasion, B.Ramanath Rai said “Our country cannot progress in the right direction until & unless our children are educated & healthy. The Akshaya Patra Foundation is doing a commendable job by eradicating classroom hunger & thus promoting education “. 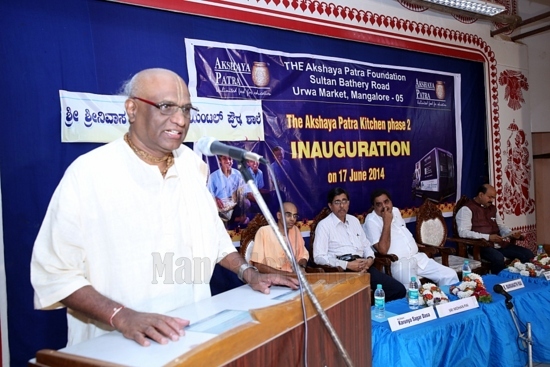 “Currently Akshaya Patra is feeding 23000 kids in Mangalore. The govt will provide support to increase the number to a lakh in coming days.” said Mohiuddin Bava. Thanking the central and the state government on whose partnership the mid-day meal programme is implemented, Madhu Pandit Dasa said “Education gives the confidence to dream and achieve. It has the potential to break the recurring cycle of poverty and promote self-sustainability. The journey, the seed of Akshaya Patra was sown 14 years back & now it has grown to a tree. All this was possible because of the generous support of all our stakeholders. We hope to continue this journey & reach our mission to feed 5 million children by 2020 across India. The Akshaya Patra Foundation a secular non-profit organization is in a public private partnership with the Indian government, which implements the world’s largest NGO managed mid-day meal programme. Akshaya Patra feeds around 1.3 million children on all school working days and the Foundation’s work has created a very wide ranging social impact among the children of poor and marginalized communities who go to government schools in India. Ever wondered how Akshaya Patra decides what is right for its beneficiaries? Here is the answer. The Akshaya Patra Foundation works towards providing the right kind of food to the children with guidance from the Government. After much discussion and research, they decide the daily menu for the children. Below are excerpts from an interview with our nutrition specialist at the Foundation. 1. How is the right quantity of nutrients determined for each child? The right quantity of nutrients for each child has been determined as per the National Programme of Mid Day Meal in Schools (MDMS) specified by the government of India. As per their age group, certain norms are set pertaining to nutrition. A cooked midday meal should primarily provide 450 calories and 12 gm of protein to a child in the age group of 6-10 years. A child who is about 11 to 15 years of age needs a total of 700 Calories and 20 gm of Protein. These meals should also include micro nutrients like Iron, Folic Acid, Vitamin A and so on, in adequate quantities. 2. What are the top nutrients each child needs and how is Akshaya Patra ensuring they get these? Children require different kinds of nutrients but most important are energy, protein, folic acid, vitamin A, iron, calcium and zinc. The Akshaya Patra recipes contain different food groups (cereals, pulses, vegetables, spices, sugar and jaggery, edible oil and more) to ensure an adequate supply of nutrients. The recipes are standardised by calculating nutritive values referring the NIN guidelines (nutritive value for Indians as per the National institute of Nutrition ICMR Hyderabad) and our recipes are verified through external lab analysis. 3. How is the quality standard of raw material maintained while procuring for the mid-day meal? The quality of raw materials is ensured by Supplier Quality Management Programmes. The raw material specifications are circulated to suppliers to ensure they deliver good quality raw materials. The raw materials are thoroughly checked by the TAPF quality team before accepting them for use in the kitchen. The raw materials need to meet the FSSAI (Food Safety and Standards Authority of India) and AGMARK specifications. They are stored following proper storage practices and are utilised as per FIFO (First In First Out) FEFO (First Expiry First Out). 4. What are the health benefits of providing good nutrition? It helps in overall growth and development of the body and helps to prevent micronutrient deficiencies such as anaemia, vitamin A deficiency and so on. Good nutrition is also scientifically proven to aid the cognitive development of growing children, a factor vital towards helping children succeed in school. 5. Has there been a marked difference in the health of children consuming the mid-day meal (physically and mentally)? Yes, sufficient intake of the meals has helped and continues to help in the overall development of children belonging to underprivileged sections of the society. It has also helped curb issues like malnutrition, mortality rates, stunted mental and physical growth in underserved children. The mid-day meal has helped eradicate classroom hunger. Children are now able to concentrate in the classroom and there is an increased participation in extracurricular activities as well. The Akshaya Patra Foundation is a NGO that was started in Bangalore in June 2000. It implements the mid-day meal programme in Government schools under the aegis of Central Government and various State Governments. Akshaya Patra serves mid-day meal to 1.3million school children every day. Q: Is Akshaya Patra a registered charity in India? A: Yes, Akshaya Patra is a registered charity under Trust Act, 1920, of India. Q: Does Akshaya Patra receive government funding? A: Yes, Akshaya Patra receives a grains and cash subsidy. Q: What are the other modes through which Akshaya Patra raises funds? A: Offline fundraising, online fundraising, events (Tastes of India, Corporate dinner, etc.). Q: How does Akshaya Patra use its resources? A :They use the resources for feeding school meals to underprivileged children in India. Q: What is unique about the Akshaya Patra mid-day meal program? A strategic initiative to address two crucial and inter-linked issues: hunger and illiteracy. A wholesome, nutritious, three-item menu, prepared in stringent hygienic conditions, as per the nutritionist’s recommendations. Implemented using a technology-intensive, centralized model that can be efficiently scaled and replicated. Secular, and inclusive, with the child as the focus. Transparent, professionally managed, and run by a Board of Trustees, with the support of committed professionals and volunteers. Audited by KPMG, one of the leading providers of internal audit and regulatory services. Q: What are the studies conducted to assess the impact of the program? Increased enrolment of children in schools. Improved retention of children in the schools. Enhanced classroom performance of children. A.C. Nielsen (early 2006) has reported that enrollment in Class I in Bangalore improved by 23 per cent; in Hubli by 16.6 per cent; in Baran (Rajasthan) by 41.3 per cent and in Vrindavan by 12.3 per cent during the first year of program implementation. Akshaya Patra is the first NGO run school meal program in India to have been selected for a case study by the Harvard Business School-USA on its operational excellence. Q: What are the allied activities of Akshaya Patra? Started in Bangalore in 2008 with 1500 children, this scheme was set up for students who need extra support in their academics. A joint initiative of Edumedia and Akshaya Patra, Akshaya Life skills was started with the vision of: “enabling young children to develop into responsible social beings with a competence to respond to their personal, social & cultural needs”. Today, it reaches out to 40 000 children with a mission is to expand to 100 000 by the 2010-11 academic year. In Baran and Jaipur, Akshaya Patra serves wholesome, nutritious food for pregnant and nursing mothers in government sponsored centers of the districts. Started in Jaipur in 2005-2006, this is a program that provides food for the underprivileged sections of society at subsidized rates. Similar to Akshaya Kalewa, this program began in 2007 in Delhi and was set up to give food at subsidized rates to the underprivileged people of the city. In the past, Akshaya Patra has also provided emergency relief during natural calamities, as desired by the district councils of the areas affected. They help where and when they can, by preparing food for victims of tragedies. Akshaya Patra works together with the BBMP (Bruhat Bangalore Mahanagar Palike) to implement its senior citizen’s feeding program. Each day, around 12,000 elderly citizens of Bangalore are provided with lunch cooked in Akshaya Patra’s own Bangalore kitchens. Medical assistance in the form of deworming tablets, Vitamin A capsules, and Becozinc capsules are provided to children in partnership with leading hospitals in respective cities. Q: Do you issue tax receipts? How soon will the receipts arrive? You can expect your receipts within 10 days of your donation reaching Akshaya Patra. Q: What happens if the tax receipt is lost? A: Akshaya Patra may not be able to provide you a duplicate receipt. But they can send you the IT certificate copy. Q: How safe is the personal information given to Akshaya Patra during donation? A: They do not share any information of the donor with any third parties or partners. They respect your privacy and your security. Q: Why does Akshaya Patra raise donations from public and corporations when the government is providing subsidy for the mid-day meal program? A: Akshaya Patra is feeding over 5 lakh children in Karnataka in five locations: Bangalore, Hubli-Dharwad, Bellary, Mysore and Mangalore. One of the important features of the Akshaya Patra program is that feed unlimited servings to the children. Akshaya Patra is feeding over 1.2 million (12 lakh) children in 19 locations in nine states across India. The national average cost of the meal that Akshaya Patra provides is Rs.5.09 (2009-10). The national average subsidy received from the government (cash plus grain subsidy) is Rs.2.69. Hence there is a gap of Rs.2.41 to be raised by The Akshaya Patra Foundation to meet the running expenses. Akshaya Patra feeds over 13 lakh children every day in the country. For expenses incurred over and above the subsidized rates, they thererfore raise donations. In addition, Akshaya Patra sets up centralized kitchens to cook for large numbers of children without any support from the government. They raise donations from the public as well as from corporations to meet this expense. To set up 17 locations in eight states of the country, they have spent close to Rs. 815.3 million (Rs. 81.53 crores). Click here to see the detailed break-up of the Capital Expenses in setting up of the kitchen infrastructure in various locations till date. Q: Does Akshaya Patra have permission of the government to receive donations from foreign countries? For receiving donations from foreign countries, Akshaya Patra has taken the permission from Ministry of Home Affairs, Government of India, under Foreign Contributions (Regulations) Act and the statements of all donations received are being reported to the Home Ministry year after year. Please find the copy of the notification in Akshaya Patra official website. The foreign donations that they receive is a small percentage of our total requirement (about 10%) and it is mostly from a few well known industrialists of Indian origin.